October 1st, 1949 was the day that the Chinese Communist Party (CCP) took power. Since then, the Chinese nation, which has five-thousand year’s traditional culture, beliefs and wisdom, has undergone a horrendous disaster. Throughout China, people are suffering tremendously; the value of humanity is twisted; morality is degenerated, and the CCP’s 'party culture' has infiltrated and eroded Chinese people’s souls, and as a result, the country with long history of Chinese civilization has been humiliated. In particular, since July 20th, 1999, besides extending its evil persecution to Falun Gong group believing in the principles of “Truthfulness, Compassion and Truthfulness,” the Chinese Communist regime is also overtly against human civilization. With incessant exposure of cruel torture methods, the Chinese Communist regime’s persecution of Falun Gong practitioners has gradually aroused indignation among people around the world. The publication of the “Nine Commentaries on the Chinese Communist Party” (an editorial published by The Epoch Times newspaper) at the end of 2004 has brought about a huge wave of withdrawing from the CCP and its affiliated organizations among the Chinese people. With the powerful momentum of the campaign, so far there have been over fourteen million people declaring their withdrawals from the CCP and its affiliated organizations. 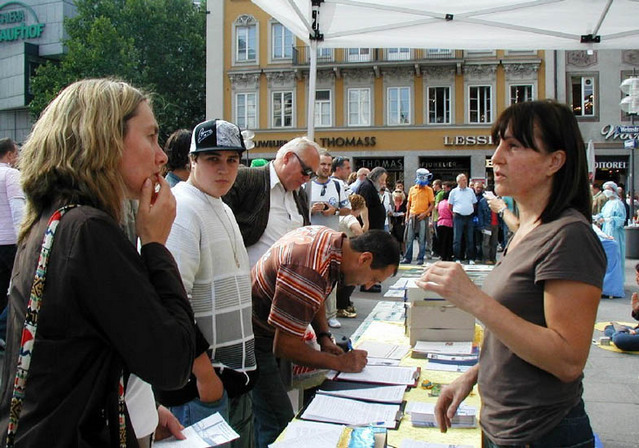 With Falun Gong practitioners’ incessant explanation of the facts about Falun Gong worldwide, more and more people are eager to understand Falun Gong at present. As soon as practitioners were moving things from their cars, some Germans and Italians came over to ask for some information. During the activities, some passersby who have understand the fact of Falun Gong presented white roses to practitioners to show their support. With the progress of the great wave of the CCP-quitting campaign, the Chinese Communist regime has become more and more nervous. On one hand, it has escalated its persecution against Falun Gong practitioners and other people from all walks of life, for one thing, the apprehension of the lawyers who appealed to support Falun Gong, such as Gao Zhisheng and Kuo Feixiong, etc. Since last March, after the exposure of the Chinese Communist regime’s atrocities of harvesting organs from living Falun Gong practitioners, it has stepped up efforts to destroy all kinds of witnesses and evidence. On the other, the Chinese regime has either kept quiet or denied the allegations at home, while asking its state-controlled media and Websites to denounce the “Nine Commentaries on the CCP” as well as the ensuing great wave of CCP-quitting campaign in foreign countries. In practice, it has redoubled its efforts to persecute the practitioners who made copies of the “Nine Commentaries on the CCP” or disseminated it and those who advocated justice. In addition, it traced down those who declared their withdrawals from the CCP and its affiliated organizations with real names so as to persecute them. 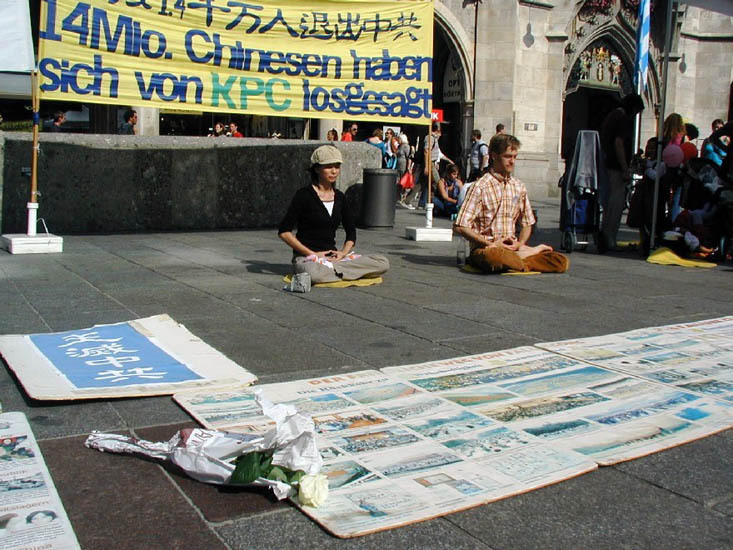 A Falun Gong practitioner in Munich, Dr. Huang Sifan, mentioned that her mother, Jiang Xiaochai, is an elderly woman in her 70s. Since five policemen from Beijing’s Zhanlan Road Police Station found two copies of the “Nine Commentaries on the CCP” in her home, the police alleged that they would send her mother to a forced labor camp for reeducation. But her mother happened to be hospitalized in critical condition. The police even traced to the hospital, but were stopped by the doctors. They thus took away her medical record. Furthermore, the police threatened other non-practitioner family members, and coerced them to sign a statement. In the meantime, they banned her mother from leaving Beijing or leaving home alone. Dr. Huang also said that the Chinese Communist regime has been very nervous about the “Nine Commentaries on the CCP,” and that judging from what it treated this elderly disabled woman in her 70s, we can know how evil the Chinese regime is inside while it appears to be strong outside. 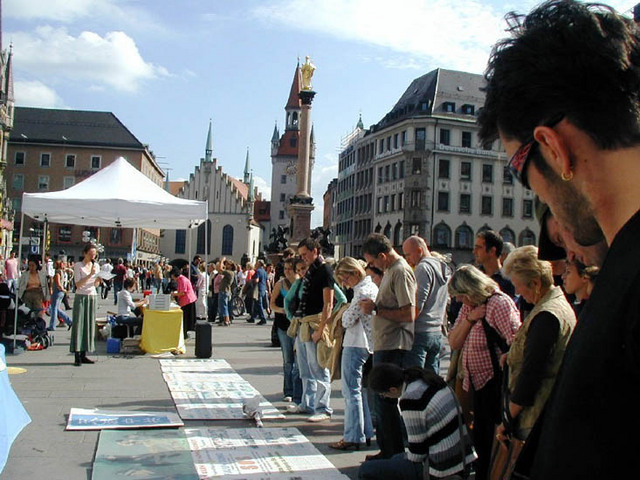 The Chinese Communist regime's ruthless and persistent persecution of Falun Gong has attracted the international society’s attention. Especially after the exposure of the regime’s harvesting organs from living Falun Gong practitioners since March, 2006, many politicians and human rights lawyers have expressed that they want to conduct independent investigations into this incident. More and more people have found that after since the Chinese Communist regime started to persecute Falun Gong in July 1999, innumerable Falun Gong practitioners, without through legal proceedings, have been imprisoned in forced labor camps, prisons, hospitals and military institutions, where their internal organs may be illegally removed for transplant for huge profits while they are still alive. The Vice President of the European parliament Edward McMillan-Scott made an exclusive trip to Beijing last May to investigate China’s human rights situation and met with two persecuted Falun Gong practitioners at the same time. On the morning of July 6th, 2006, David Kilgour, former Chair of Canada’s Parliamentary Subcommittee on Human Rights and former Secretary of State for Asia-Pacific, and David Matas, renowned human rights attorney, held a press conference in Ottawa, in which they released their “Report into Allegation on Organ Harvesting from Falun Gong Practitioners in China.” The report confirmed that these organs-harvesting allegations are true. Australia’s ruling party and the largest opposition party reached a cross-party consensus on calling for an independent international investigation into the Chinese Communist regime’s harvesting of organs from living Falun Gong practitioners. On September 4th, 2006, the Swedish Christian Democratic Party, the Leftist Party and the Environmental Party released a joint statement: “CCP must stop stealing organs,” urging the Swedish government to take up a position with other countries in the European Union, Council of Europe and UN to force the CCP regime to immediately allow open investigation of all Falun Gong practitioners and other prisoners of conscience held in prisons, labour camps, detention centers, hospitals and mental facilities. On September 7th, 206, the European Parliament unanimously passed an Amendment to the “EU-China Relations” resolution, demanding Chinese authority to release Falun Gong practitioner, Bu Dongwei, human rights lawyer, Gao Zhisheng, and other human rights defenders. The European Parliament asked China to stop death sentence and not to intimidate, persecute and imprison freedom activists. On September 28th, 2006, Canadian Minister of Foreign Affairs Peter Mckay harshly criticized China for its human rights and democracy situations. This has been one of Canada’s bluntest comments on China since the Conservative Party won in a federal election last January. 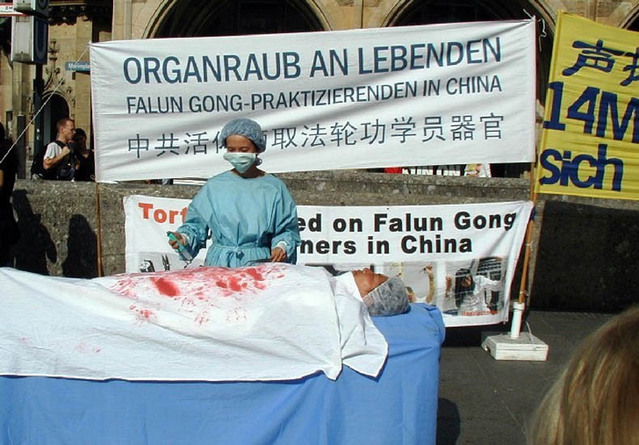 On the afternoon of September 29th, 2006, American Congress held its first hearing on allegations of the Chinese Communist regime’s harvesting of organs from living Falun Gong practitioners. Over 100 people from congresspersons from both parties and their assistants as well as others from the U.S. government agencies, think tanks and media attended the hearing. Senior congressman Dana Rohrabacher of the House Committee on International Relations urged the U.S. government to take further action to stop these crimes. As an old saying puts it, persisting in evil brings self-destruction. If the Chinese Communist regime continues its atrocious persecution against Falun Gong, it will eventually be abandoned by the world as a whole, and the CCP will soon eliminated by Heaven.